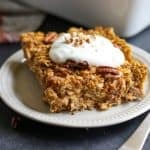 I warned you last week that my new obsession is baked oatmeal. To be fair, anything with oats is amazing in my book. 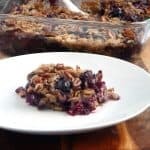 After making this Banana Bread Baked Oatmeal, I got on a bit of a kick, so I now bring you the second installment of my baked oatmeal craze: Blueberry Muffin Baked Oatmeal. I am all about breakfast that you can make ahead of time. You always have the option with this recipe. Make it Sunday night and have it ready for breakfast each morning during the week! It’s really a matter of mixing and then tossing the pan in the oven. Doesn’t get much easier than that! When it comes to breakfast, I typically bounce back and forth between some form of oatmeal and smoothies. Now that fall is just around the corner, I know a warm breakfast will be more in store for me almost every day. It’s the perfect way to start the day. Oats are seriously so versatile and the possibilities are endless. I am already dreaming up other ways to bake these so be prepared! And we all know that pumpkin season is just around the corner. Then again, to many, it starts on September 1st so I guess I may be a little behind in those terms! I drizzled mine with just a touch of pure maple syrup and it was amazing. Like many of my recipes, you have lots of options for dietary needs. These can be made gluten free, egg free and dairy free so it’s bound to please the whole family! When it comes to mornings, especially early mornings, the last thing we want to do is spend a lot of time in the kitchen. So be prepped and your day will start out on the right foot! In a mixing bowl, combine egg and milk and whisk. Add vanilla, coconut oil, maple and whisk to combine. Add baking powder, cinnamon, and oats and stir to combine. Pour mixture into an 8x8 baking pan lined with parchment or greased with coconut oil. Bake for 35-45 minutes or until top is golden brown. Blueberries will also start to bubble slightly at this point. 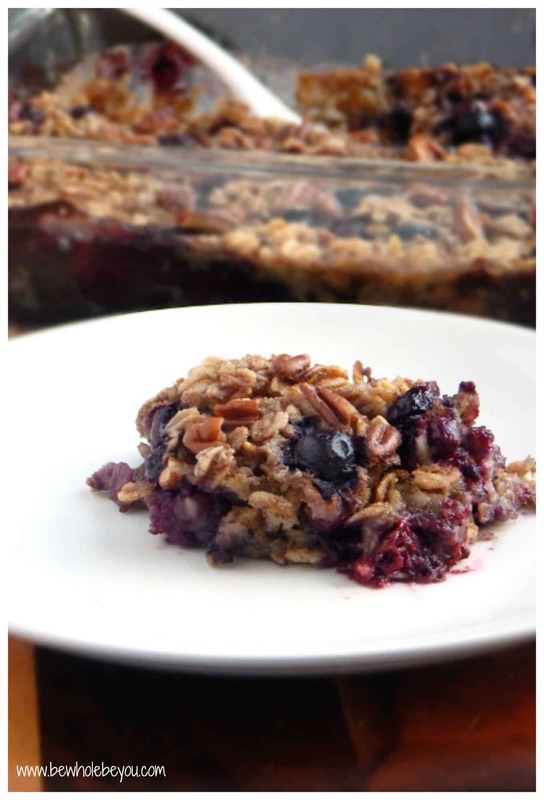 Allow to cool and serve with a drizzle of maple or extra blueberries on top. The texture of this is slightly crisp on top and soft in the middle. If you prefer the inside to be a bit more sturdy, add less milk.